Today’s Friday focus is Paul Schumacher, author of high fantasy, fairy tales, and romance novellas and novels. 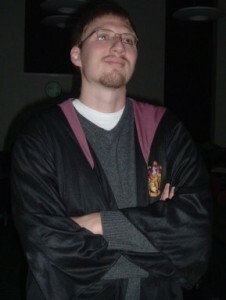 Born in the Chicago area, Paul Schumacher has always been a full-fledged geek. He can quote Star Wars, knows a fair amount of Tolkien Lore, and will go to the mat about which Star Trek Captain is the best. Paul earned an English Degree, from Illinois State University, specifically to become a novelist so that he could take two decades of Dungeons & Dragons game stories and make books of them. “The Lavoria Chronicles” and a collection of short stories have been the result so far. Little Red Wolf is a fairy tale re-imagining where Little Red Riding Hood is the hunter and the Big Bad Wolf is helping her to save her father. “On My Honor” is a romantic novelette where a knight needs to save an evil princess from a tower … and he gets the help of an attractive witch along the way. I am still a big magic and dragons type of reader but I love to read any story depicting the perseverance of the human spirit. It has to have a mostly happy ending, though. If I struggle through the marshes of Mordor with a character for thousands of pages then they better have a satisfying ending! 2. Is there a certain type of scene that’s harder for you to write than others? How do you deal with this? Travel scenes are the hardest. When characters find themselves moving from one location to another location I will beat my head against the table trying to figure out something interesting to say. 3. What literary character are you most like and why? King Arthur – I’m full of chivalry and I am a little too trusting of the people around me. Without my friends and allies to guide me through life, I would be lost. 4. What do you want your readers to take away from your works? I want people to think outside of the box. I want people to internalize the little bits of philosophy that I sprinkle between the lines. I want people to read my stories, draw in their lessons, and become better people. 5. Why do you write in the genre(s) you listed above? I write fantasy novels because I love fantasy stories. Also, I’m always terrified I’m going to mess up the science in a sci-fi book. Then there is romance, which helps pay the bills. Little Red Wolf is available now at Amazon.